Things to avoid putting down your garbage disposal | Robins Plumbing, Inc. Almost every single one of us has been guilty of jamming the disposal, and there doesn’t ever seem to be a convenient time to have your kitchen sink backed up, but have you ever noticed that it almost always seems to happen on a Holiday or right before a big party you’re hosting? Here are some things to avoid putting down your garbage disposal, trust me when I say that your sink has not plotted against you and it isn’t a conspiracy, it is simply a math equation. We clear several hundred clogged disposals throughout Phoenix each year, and the bottom line is that we, as homeowners abuse and mistreat our drains. During those holidays and big parties we overwork the disposal because we’re in a hurry and we assume the disposal can take it. The truth is, usually the disposal can, it is the drain attached to the disposal that puts a stop to production. 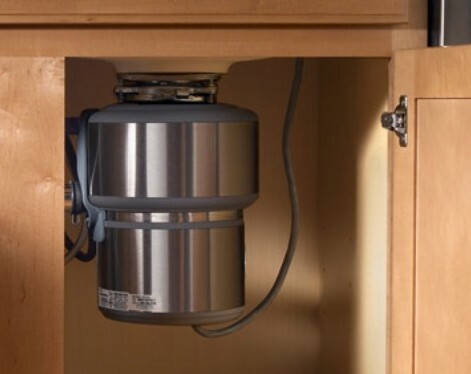 Your disposal is very similar to having a blender at your sink, that food then has to exist the disposal at high-velocity and then hits the bend of the drain line, too much, too fast creates a build up there at the bend and ultimately creates a stoppage. This stoppage can be avoided. First off, never overload your garbage disposal, a reasonable amount of debris to send down is about half a cup at a time always allowing the disposal enough time to grind down the food and flush it through the drain line before adding any more. If you have the misfortunate of jamming your disposal, this is indicated by hearing only a humming noise when you turn the power on, take a deep breath, and follow these steps. Take the allen wrench that came with your disposal and insert it into the bottom center of your disposal. This allows you to manually turn the grinding mechanism. After getting the blades to move freely, remove the allen wrench. Turn the disposal back on. If you turn your disposal on and no sound comes at all, you will need to reset the breaker for your garbage disposal, that is the red button located at the bottom of the disposal. If you need drain cleaning or professional plumbing services in the Phoenix area, reach out to Robins Plumbing today. Our plumbing company specializes in several facets of plumbing, including both residential and commercial plumbing services. Whether you need drain cleaning, water heater repair and replacement, backflow prevention, faucet repair and replacement, restoration and flood cleanup, or slab leak locating and repair, our team can help. We pride ourselves on providing each and every one of our clients with impeccable customer service, and when you call our team, we’ll do everything we can to make sure your plumbing needs are met in a timely and professional fashion. Contact our local plumbing company today to learn more, or visit our reviews online to see what others have to say about us! If you find yourself needing assistance from a professional plumber beyond these steps please call our office, we are here to help.